Our fourth project with this client. Having successfully worked with the owners of this sprawling West Berkshire family home on three previous occasions, it came as no surprise when they contacted us to assist them on their latest project. 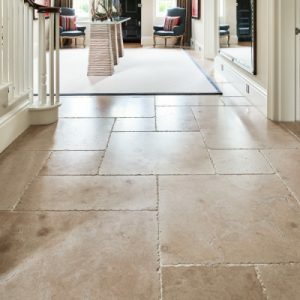 Already huge advocates of the benefits of natural stone, they wanted a warm limestone to complement their wonderfully eclectic home. 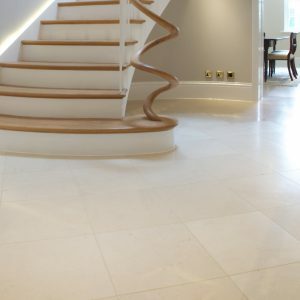 Buscot limestone was chosen for the ground floor entrance and hallway, which seamlessly flows into the magnificent McCarron and Company kitchen and the adjacent laundry room. A seasoned finish and American pattern, with super-large slabs, helps to pull this unique and impactful look together. Working closely with luxury bathroom retailer Aqualis, we achieved unique looks in each of five bathrooms ranging from the spa-like master en suite, with pale limestone and bespoke vanity tops, through to a more masculine style, using the striking Firenze limestone as shower cladding, and a custom-sized shower tray milled to falls.